I am asked fairly often if I know anything about the original owner of a vintage item. What did she do, what did she look like—who was she? I have written about some of the women I have either met or gotten to know a bit through their clothing, and it’s about time I updated with a few more. I don’t always have the good fortune to know anything about an original wearer of the vintage fashion I find, but when I do I pay close attention so I can share their stories. There are more, and they have been so gracious to me. I have many unofficial grandparents! I think of Ruby, who made her own clothes with impeccable skill and cried when I offered her money for the clothing, which she was just going to “put out on the curb.” All 100+ pieces of it! Carol sat on the stage with her boyfriend, the pianist with Lawrence Welk, while they were taping shows. There was the gentleman whose wife had passed away and he was finally ready to let go of some of her clothing. He gave me a fantastic set of highballs he bought at the 1963 Seattle World’s Fair when he found out I’d grown up in Seattle. One man I met had just purchased and laid down a load of stones to make his driveway a little smoother for my visit. His wife had been a manager of better sportswear at a department store in Spokane. We talked quite a bit because my father played jazz trombone and he had a boatload of jazz albums and played jazz himself. He asked me where I thought he got his accent and I guessed New York. He said Chicago, which is his nickname. He came to Spokane when he was 12 and he was then 105. Then there was Elaine who was sweeping her walk when I first met her. She is African American and came to Spokane on V-J Day, September 2, 1945. Her clothes were so precisely cared for and pristine that they were as if new. There are many more. One that truly haunts me was an Italian-American model whose daughter offered me her mother’s clothing. 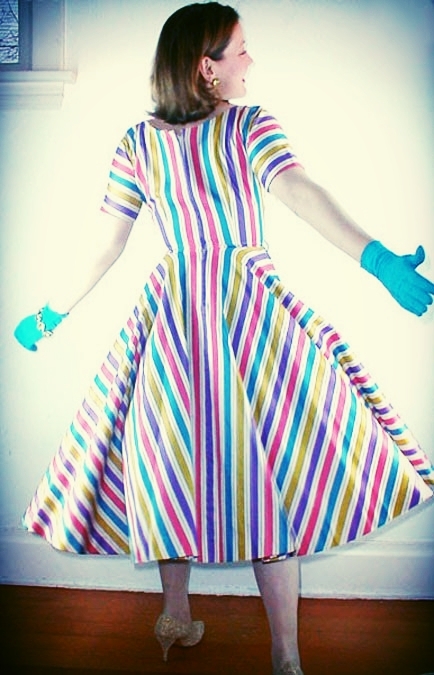 She had wonderful items, including this Howard Greer dress. I happened to see her photo and she was one of the most beautiful women you could possibly imagine. She had died estranged from her family and had a very hard life, including alcoholism. Her clothing was very well kept and of spectacular design. Sometimes there is a name tag or signature. I especially love it when items have notes or pictures with them, giving us an idea when and how something was worn. One of my most recent acquisitions is an intriguing (and large!) collection that belonged to a ballet dancer and her mother. Both apparently dressed to be center of attention—the dancer just more youthfully. Many things were altered or embellished…there is an overwhelming sense of flair to everything belonging to these women, which seems fitting! I like to think that we perpetuate these people through carrying their stories—along with their clothing—forward. Every now and then I get to offer something that brings tears to my eyes. If I’m feeling even the slightest bit jaded about vintage clothing, the passion comes roaring back when certain items come up. Right now in my Etsy shop, I’ve just listed such an item, a dress in excellent shape, cut of silk. It looks like a Beatnik top with a printed skirt, but it is all one piece. 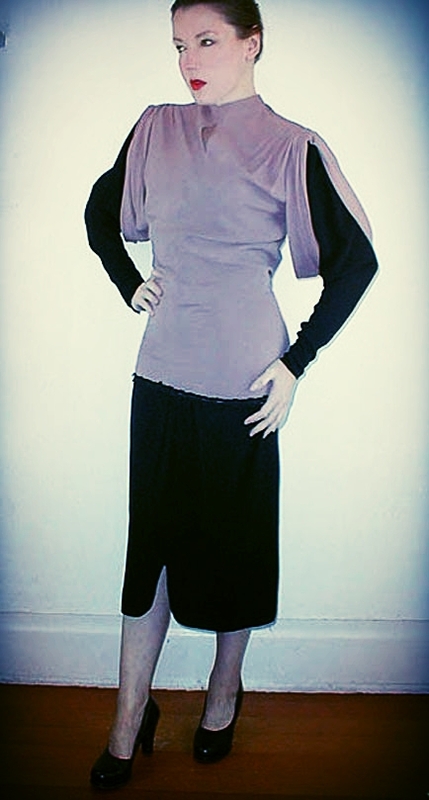 The top is black silk shantung, and the skirt is silk surah. What makes the dress so special is the skirt print: Reimagined in orange, brown, gold, lilac, black, and white, are actual modern art exhibition posters that date from 1950 through 60. 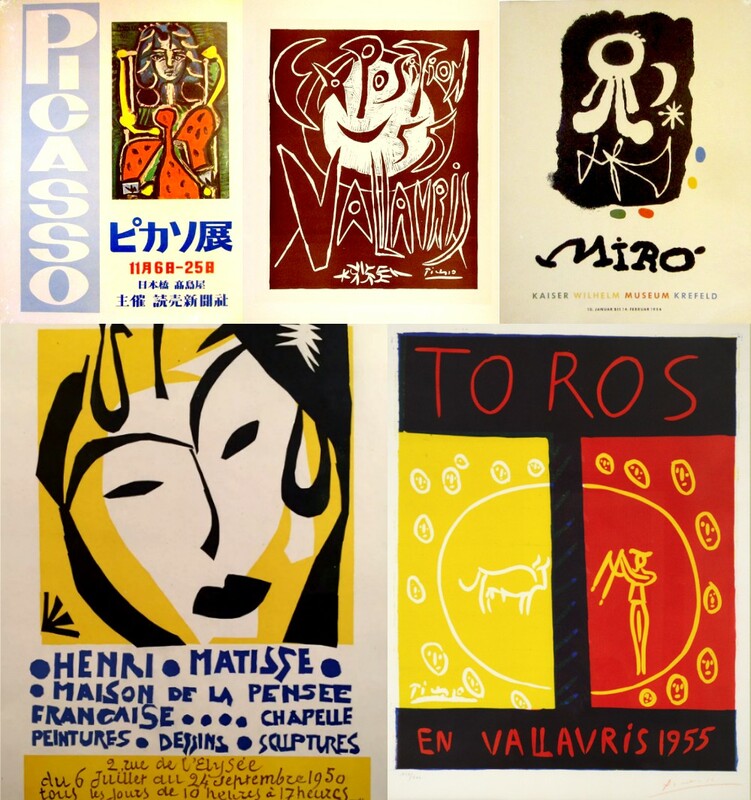 The art exhibitions took place in France, Germany, and Japan, and were shows of the works of Joan Miro, Henri Matisse, and Pablo Picasso. I have located originals of these posters available online, and they are glorious works in themselves. Imagine wearing this dress to a gallery opening, or an art museum—You would feel among the works of art! What Color is Your Parachute (er, Scarf)? 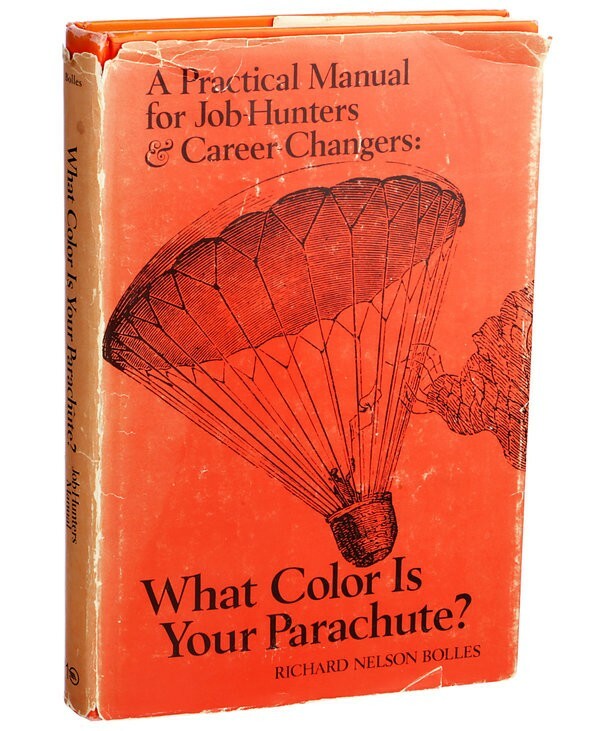 Richard Nelson Bolles’ What Color is Your Parachute was self-published in 1970, and since 1972 has gone through 40 commercially-published editions, translated into 22 languages, and sold over 10 million copies. After reading it many years ago, I felt like it expanded my perception of what was possible in a career. At the same time that Bolles’ book first became widely available, Vera Neumann (1907 - 1993) was flying high. Her parachute cloth (more about that in a second) had been unfurled and printed in ecstatic colors, becoming a form of modern wearable art. Glitterati and career women both wore Veras—whether wrapped around ponytails, necklines, or waists, they gave a fresh, expressive look to an outfit. Vera Neumann used to be simply Vera…the one and only Vera. Now we call her by both names to differentiate her from the newer Veras (Wang and Bradley) on the scene. She was born Vera Salaff on July 24, 1907. A truly prolific designer, she got a good start from her father, who took her to the Metropolitan Museum of Art every Sunday, and gave her 50 cents per art-filled sketchbook as a child. Vera met and married Austrian George Neumann in 1943, and together with their friend Frederick Werner Hamm they began silkscreening textiles in their studio apartment in Manhattan, calling their business Printex. They started out with just placemats because they were curing these in their own small oven. The business, and the space required, expanded rapidly after Hamm secured their first order from B. Altman. It was during the peak of World War II when linen became difficult to obtain that Vera first came across some parachute silk being sold at an army surplus store. By the late 1940s she had expanded from home textiles to scarves made of parachute silk. 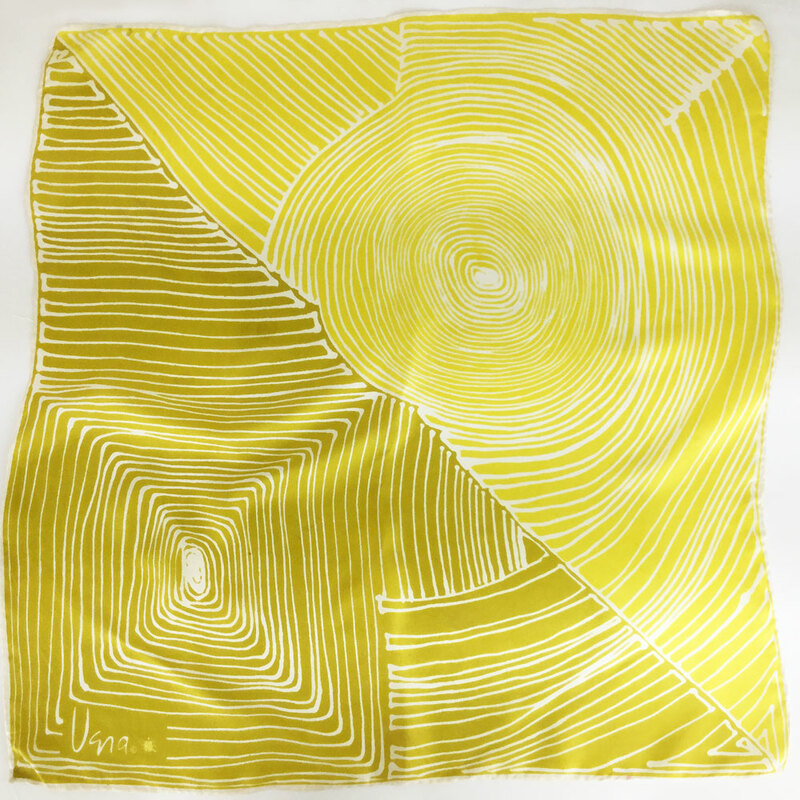 Vera was the very first to sign her name to a scarf, as an artist signs a painting. In the 1950s her work was popular with Marilyn Monroe, Bess Truman and Grace Kelly. John Lennon was the first customer for a Vera painting when her oils were shown in 1970. 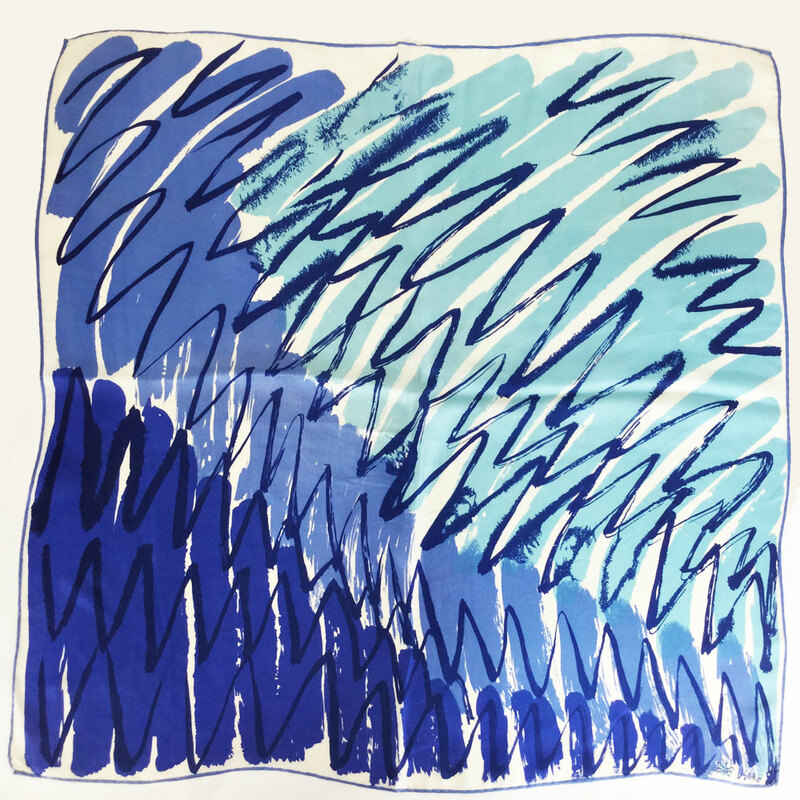 Department stores started presenting her scarves like artwork in the early 70s. By 1977, Vera’s sales were over $100 million. A tour of Vera’s history in 2:25. Time well spent. The designs of Vera Neumann took many forms over the years, ranging from the small, often botanically-inspired designs, to boldly patterned, modernist abstracts. She obviously loved juxtapositions of bright colors, and gave a lot of thought to how her layout of pattern could make an interesting scarf. There is a consistent love of detailed natural elements and energetically free brush strokes. Nothing looks like the paint has even dried yet, so fresh are her designs. How many scarves To make a parachute? I recently acquired a large drawstring bag filled with scarves. How large? Large enough for Santa to sling over his shoulder and make children feel giddy, only in this case I’m the one who is giddy. The bag came from one woman, and most of the contents are scarves made by Vera Neumann between 1960 and 1982. I don't know the woman who collected these scarves, but I know a few things about her based on her collection. She loved Vera of course, and she wore just about every color, some more often than others. I have had to put aside over 30 of the scarves because their wear has been a little too much (these are now in the hands of a colleague for her reuse). Very special designs I believe the collector kept rather carefully, protected from overuse. Most of the very best were not overused. I have been given a few Vera scarves as gifts through the years, and admired the ones I've found secondhand, but never have I seen 100+ of Vera's scarves at once before. Right now you will find 40 or so Veras in my Etsy shop, and there are more to come. But caveat emptor: This batch is going fast. The best parts of this world were not fashioned by those who were “realistic.” They were fashioned by those who dared to look hard at their wishes and then gave them horses to ride. Vera may have needed to use parachute silk at one time in her life, but she had no trouble with flying high. How fortunate we all are to be able to wear such an artistic flight of fancy as a Vera scarf, having to think about tying ideas instead of fit—and to make the world brighter and more interesting at the same time. Do you have any Vera scarves yourself? What color is your Vera? The highly vetted Pantone Color of the Year for 2018 is Ultra Violet. Where Pantone is going for next year is not yet known, but I have my own Magtone prediction, which is a blend of shocking pink, red and violet, called Jazzberry Jam. I didn’t make that name up—go google HEX color #BD0048—yet it seems appropriate because I got the idea from jam. How do I vet my color choices? Well, this one came to me when, on a late summer Sunday, I was having a piece of toast and the black currant jam clinging to the side of a jar was sparkling in the sunlight at our kitchen table. My eyes started tearing up, and I felt it in my soul. That’s it. 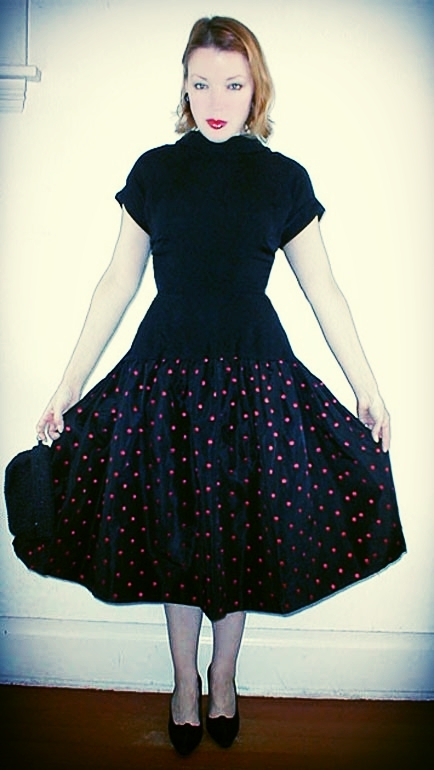 So, with this beautiful shade in mind, of course I had to go looking for vintage fashion that showed it well. 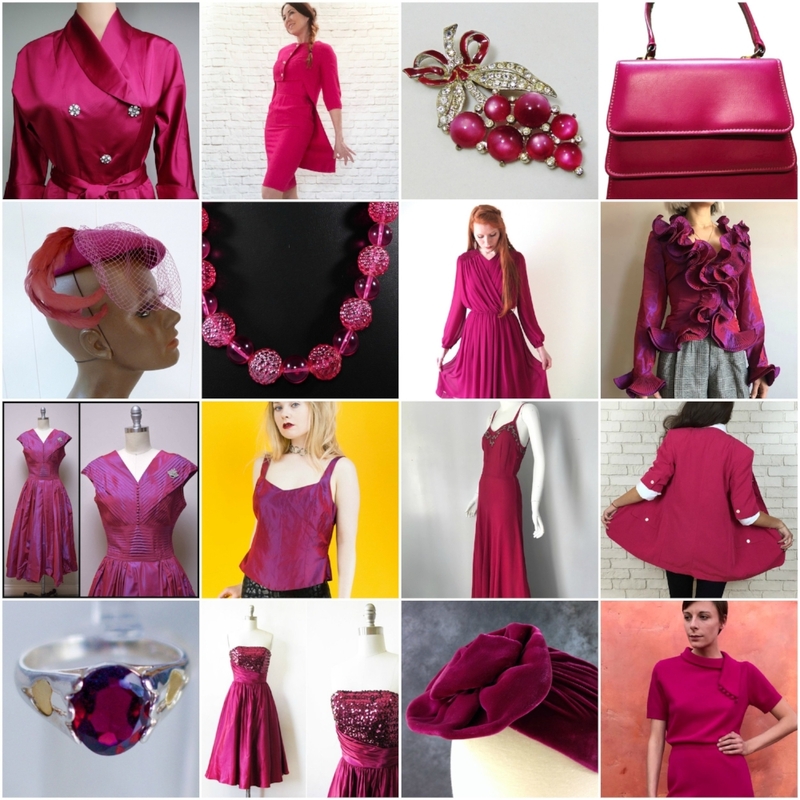 Feast your eyes on shades of Jazzberry Jam from vintage sellers on Etsy. As of today these are currently for sale and the links are in my Etsy favorites collection on the subject. It makes a very rich formal shade, looks lovely in velvet, iridescent fabrics and jewelry. 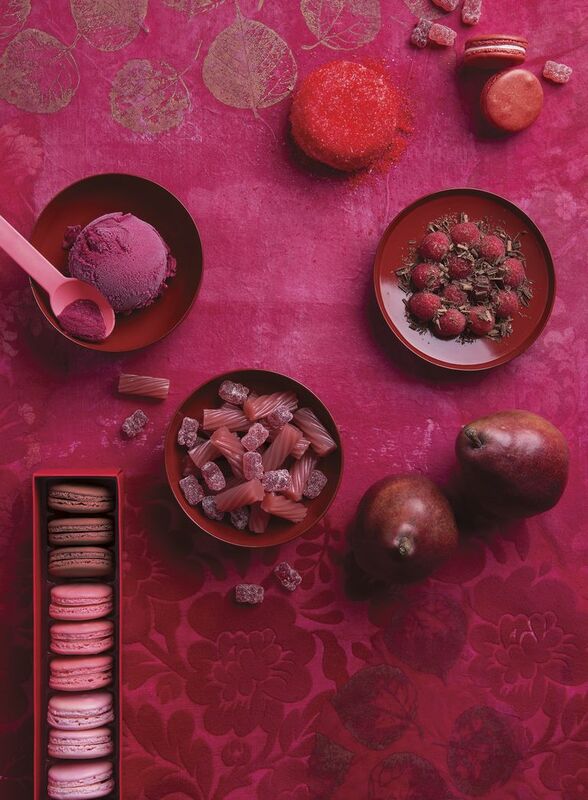 In short, it makes a great color going into our Northern Hemisphere’s winter—and the November midterm elections in the U.S.
And hey, I may actually be on to something with this Jazzberry Jam thing: This is an image from Elle Decor, looking toward the predictions from Pantone for 2019. I may not be the only one feeling this! What about you—Do you like this color? Do you wear it? What does it say to you? If you have read my blog for any length of time you know I'm awfully fond of the manatee. 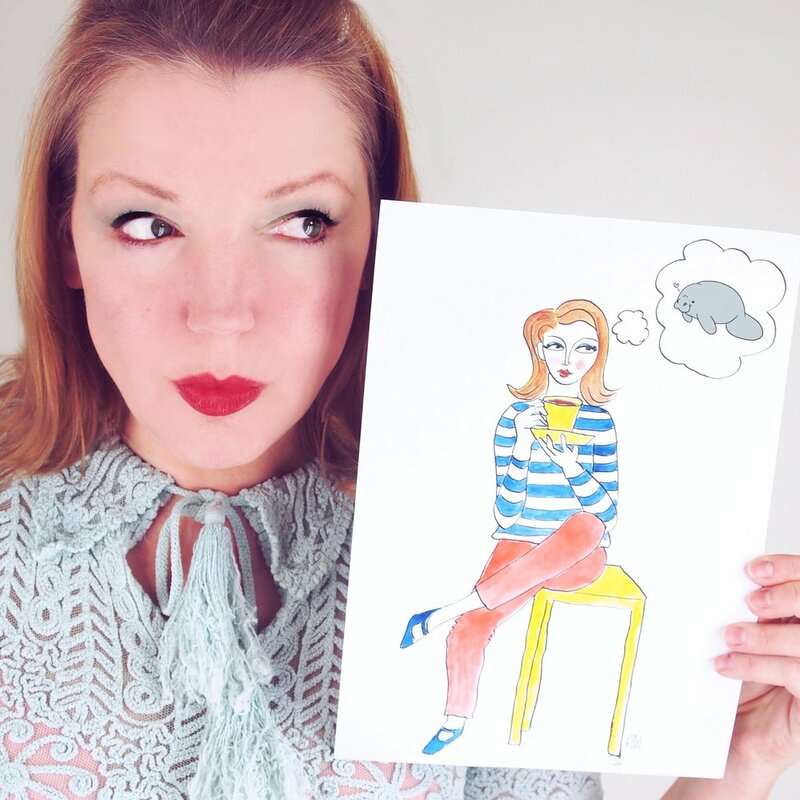 Some people even know me as "the manatee lady" — I think that's supposed to be a compliment! But can we get serious for a minute? Humans are the gentle herbivores’ only threat, with our fishing lines ensnaring them, our pollution poisoning them, our boats striking them and our living space encroaching upon theirs. The pressure on this species is greater all the time, with increased human population, loss of habitat, and more use of watercraft. Loss of wintering grounds, harassment of manatees at some locations, degradation of water quality and the loss of vegetation upon which manatees depend have all taken and will continue to take a toll. This year's huge manatee death toll due to red tide is evidence of the tenuousness of the survival of the species in Florida waters. This is not a story that can end well for the manatee without our help. I don't want to live in a world without these wonderful creatures. Today is International Manatee Day, and the day marks the 2nd anniversary of my setting aside 10% of all denisebrain sales to Save the Manatee Club for the protection of these beloved and imperiled animals. I will make another donation on behalf of denisebrain's customers today, with gratitude to all who support me in this. You might know I love what I call a Vintage Convergence, finding an advertisement, pattern, or photo that depicts a vintage item that I have. You can see some found by myself and others on my Pinterest board devoted to the subject. As sort of a variation on a theme, I'm participating in #myvintagecover, a challenge in the blogosphere and the Instagramosphere, conceived and hosted by Tanith (tanithrowan.blogspot.com) and Nicole (theartyologist.com). 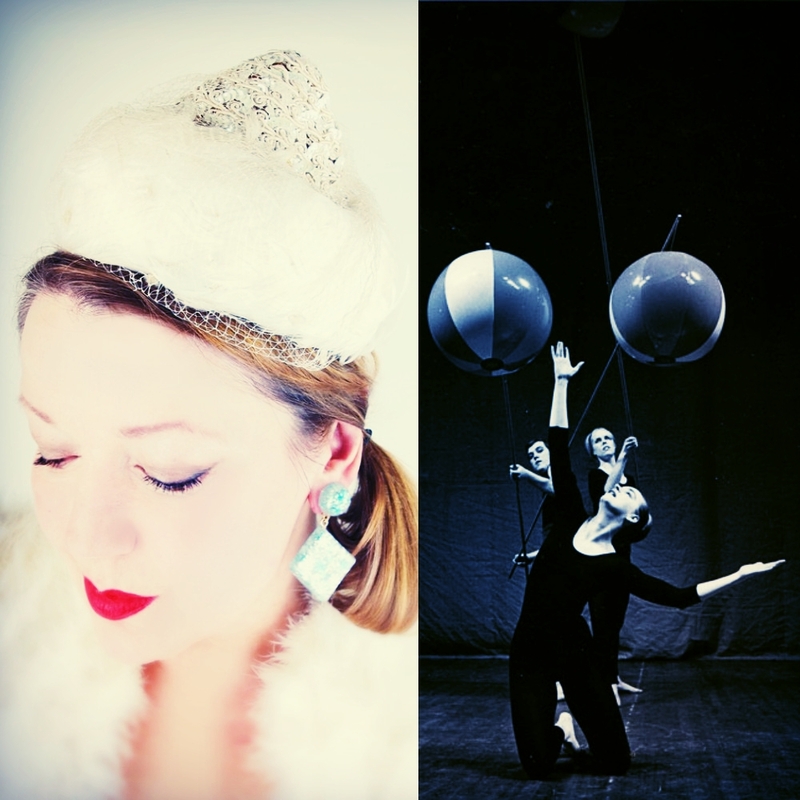 For this challenge, you recreate a vintage fashion magazine cover, or another vintage fashion photo. This isn't a competition, it's a community event. I love trying to do this myself, and seeing what other people come up with. This was my entry last year. I used a hat I had for sale (and a ton of black eyeliner) to try to get the vibe of the June 1962 cover featuring Jean Shrimpton. This year I've been focusing on 1940s and 50s Harper's Bazaar covers. This first one was a lucky coincidence for me. I had already photographed (and sold) the dress, labeled Karen Starck for Harvey Berin, when I discovered the cover designed by the great Alexey Brodovitch in 1952. Even though the dress was no longer in my possession, I had photographed it from almost the same vantage point. 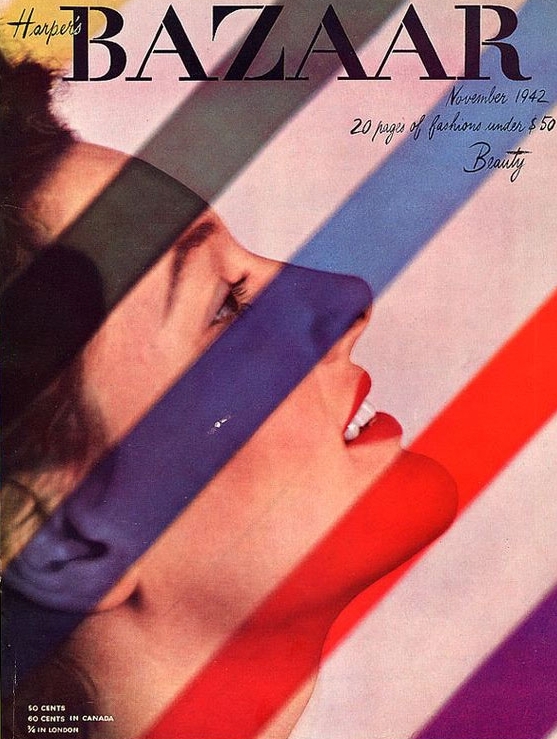 This second is a Herbert Bayer-designed cover from (gasp!) August of 1940. Can you believe how timeless this looks? Finally I chose this cover from November of 1942, just because I love the positive look it portrays. Isn't fashion about taking on the world as it is, and making it more beautiful, more livable, and more hopeful? That's how this cover, dating from WWII, feels to me. My aunt Marie with me at the tender age of one—I think I was eating her light meter. Look at Marie's striped cotton beach shoes! This is a little homage to the clothing, especially the prints, my Aunt Marie wore. She died when I was just 3, but I still have a few of her clothes. I wish I had more. Here she is in the late 50s. She was born in 1899, so she was in her late 50s too. Just look at the skirt! I would absolutely wear the whole look (including the glasses) right now. Me at 19 or 20 wearing Marie's French guard print shirt. I finally wore that poor shirt to death! At the time of Marie's death, my family gathered all her household possessions, and some of her costume jewelry (she had a penchant for colorful rhinestones) and clothing survived in our basement until I was old enough to decide I really liked it. 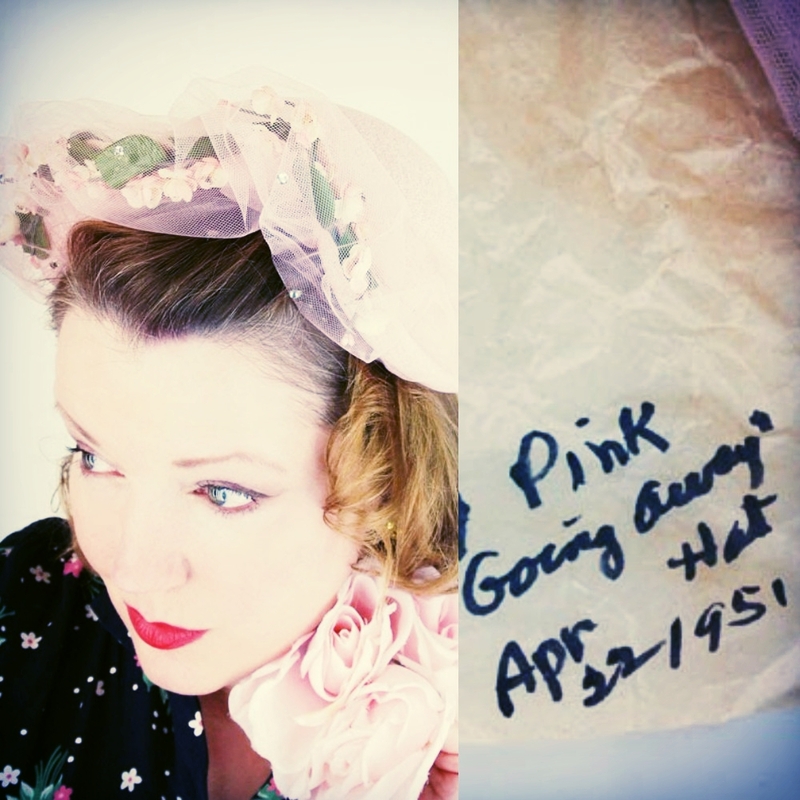 Some of my first vintage wearables came out of boxes of my aunt Marie's possessions. I remember especially liking the prints, including one with an 18th-century French guard motif on brushed cotton. I started wearing it when I was about 15 or 16. Aunt Marie was a school music teacher, and had some really great music-themed prints, which I imagine her elementary school students loved. This sash, printed with antique musical instruments, was part of her stash. I wonder if it had a dress or blouse to match? I've worn this big Western print rayon scarf of Marie’s since I was something like 14...approximately forever. It is even large enough to tie into a top like this. I love knowing my Aunt Marie through her clothing. As ephemeral as mere woven and knitted yarns can be, it is an incredibly powerful way to connect to a past generation. Do you keep anyone's memory alive by wearing that person's clothing? If you've followed the progression of my Care of Vintage posts, you will know that I'm writing these in anticipation of including the material in a book which I'm tentatively calling Getting Started With Vintage—a Modern Woman's Guide. One of the best things about being this Modern Woman for whom I'm writing is the vast amount of information she can find online. In researching available texts, websites, and videos about basic mending, I have been bowled over with the quantity of really good information. Especially great for many of us are step-by-step video tutorials. I believe it is beyond the scope of my book to describe sewing techniques, but I am confident that, knowing what to look for, the beginning sewer can find what she needs to get started. If you know how to sew, you are well on your way to being able to take care of the mending needs of your vintage finery. If you are already a seamstress, my best advice is to consider the way the garment was originally sewn in your repair work. Respect what has been done to the best of your ability and your work will blend in, even if this means (for instance) not using the newest gadgets on a modern sewing machine. For those who don't know how to sew, or need a refresher, this section is about the most basic sewing skills that you may want to learn to do yourself. I know there is every kind of "modern woman" out there, and some will take off and fly with sewing, others will grimace at the very idea of threading a needle. For the reluctant, a seamstress can do these tasks for you. For the potential aviatrix, I have included some links to get you started. Although it certainly is nice, you don't have to have a sewing machine to do basic mending. Equip yourself with a sewing kit for hand mending if you don’t already have one. Included should be spools of thread in basic colors, various hand sewing needle sizes (including sharp, fine needles to slip through silk and smooth rayon), beeswax to run your thread over to keep it from tangling, small thread-snipping scissors, a seam ripper, sharp pins, and a pin cushion. You will want to keep a collection of replacement fasteners including hooks and loops, and snaps in various sizes. You can scout for vintage sewing items at flea markets and yard sales, although many of these haven't changed significantly in 100 years or more, so new will do fine. One online set of very clear tutorials for beginning hand sewers is monkeysee.com's "How to Sew by Hand" video series. If you are a little farther along in your skills, you can add patching holes and mending tears, discreet mends in lace, and restoring missing beads and trims. Buttons. Vintage buttons are their own delight, with characteristic shapes and materials associated with different eras. I like to replace missing buttons from my vintage finds with similar vintage buttons. Sometimes that means changing out an entire set if I can’t find one close enough, so it is great to have a resource for sets of vintage buttons, whether that is a shop in your town, or an online shop. There are also some pretty convincing reproduction vintage buttons to be had these days. Monkeysee.com's "Sewing on Shirt Buttons" and "Sewing on Shank Buttons" should get you started with sewing the buttons on. Buttonholes. Sometimes a buttonhole becomes frayed and needs repair. If you are ready to tackle this intermediate mend, you can find a very clear tutorial on craftsy.com, "How to Sew a Buttonhole by Hand." Hems. There are three basic hem stitches, and again, it's nice to follow the style of the vintage hem you are mending. 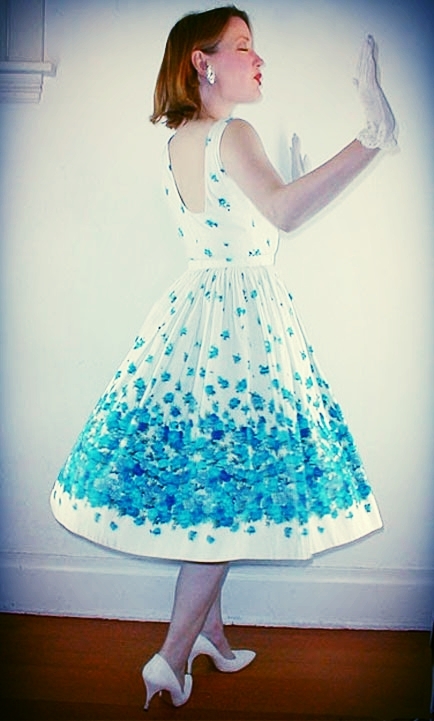 At megannielsen.com, there is a very good step-by-step tutorial for each of the hem stitches ("Hand Sewn Hems"). Pills. Those little fluff balls that accumulate on sweaters and fabrics with any nap are pretty easy to remove from wool, but not so easy when the pilling is on a synthetic fabric such as polyester. I keep both a pumice sweater block and sharp safety razor for de-pilling. The sweater block is great for wool and helps with synthetics, but a carefully wielded razor can get the more “sticky” pilling off. There are also fabric shavers with screens that are designed for various types of fabrics. Pulls. For pulling a snag or snagging a pull, I use a Knit Picker. This inexpensive little gadget hooks a snag in a knit with ease, and pulls it to the inside of the fabric. Seams. If you are sewing by hand, the sturdy and flexible backstitch is the way to go. Besides the monkeysee.com tutorial "Sewing - The Back Stitch" there's threadsmagazine.com's "How to Master the Backstitch." Snaps, and hooks and eyes. Again, those great monkeysee.com basic sewing videos include "Sewing on Snaps" and "Sewing on Hooks and Eyes". Sweater holes. If they are very small, you can discreetly mend a hole with matching thread, embroidery floss, or yarn. I like the tutorial over at tashamillergriffith.com ("How to Fix a Small Hole in a Knit"). Zippers. Because I’m deep into vintage clothing, I have a large collection of vintage metal zippers for replacing broken ones. Make sure to replace, or have a seamstress replace, a broken vintage zipper with a similar vintage model. If that's not possible (say, because you can't put your hands on a similar enough zipper), a modern zipper is acceptable. This may well not matter to you, but I'd caution you that a zipper of the wrong type can slightly lower the value of a vintage item. Also, and maybe it's just me, but I think there's a good feeling in having the right zipper, even if it's hidden. Using a sewing machine to put in a zipper is not beginning material, but using your trusty backstitch can repair a short stretch of loose stitching along a zipper. A metal zipper missing one tooth is not necessarily ruined. If the zipper still runs smoothly, don’t worry about that tooth, it may never need attention. If a zipper pull is “derailed”—slipped off one side of its tracks—you can sometimes get it back on track. [see my tutorial here]. A slow or sticky metal zipper can be waxed by running a candle over the teeth (both beeswax and soap also work). 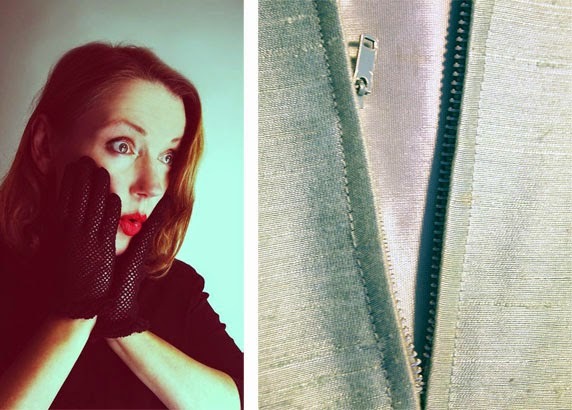 A stuck vintage zipper can sometimes be budged by pushing on the teeth with a thick needle. You can also carefully dab the stuck section with a cotton swab soaked in WD-40. Once you have it going, launder out the WD-40 if possible, and then lightly wax the zipper with a candle. When your cat and you had a fabric-ripping tussle, a moth ate your best sweater for lunch, or you stepped through the hem of your best gown, it's hard to imagine how a vintage favorite will ever be wearable again, but don't despair, many flaws can be discreetly fixed or camouflaged by a skilled seamstress, if not you. 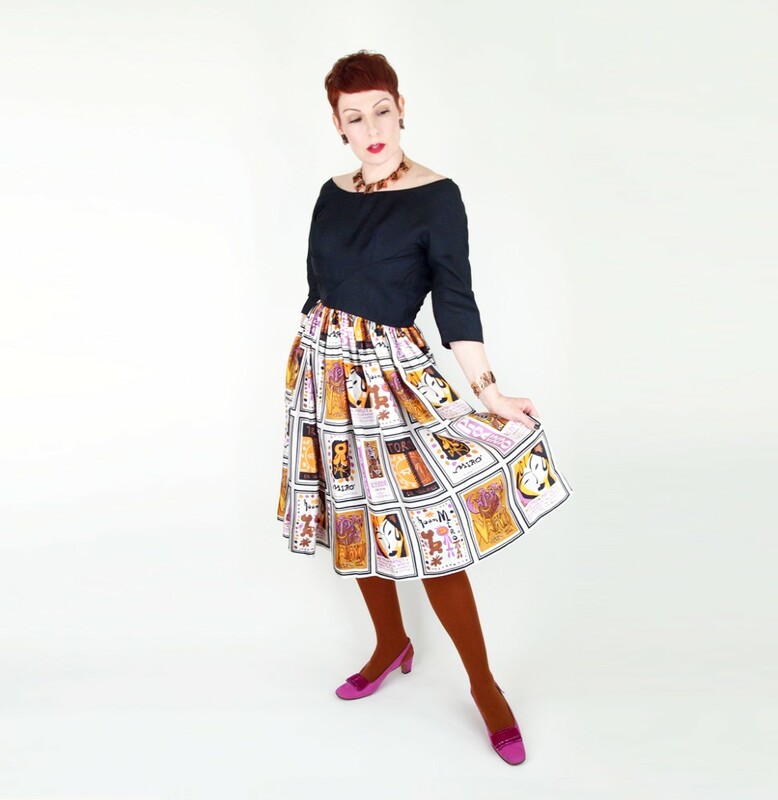 Refusing to give up on a great garment is a very vintage virtue. You've heard the expression make do and mend? It dates from WWII, when rationing and shortages were par for the course, but in our time, with limited resources and an awareness of the impact mass consumption has on the planet, doesn't making do and mending seem sensible? In case you didn't catch the beginning of this Vintage Care series, let me explain that I'm working out a section of my book. This is more or less a rough draft, and I'm very much open to corrections and suggestions, so please comment! I've discussed clothing care and storage, and many of the same guidelines apply to accessories, but here are some more things to consider. Hat boxes are not only attractive but (surprise, surprise!) very useful for storing your vintage hats, although other boxes will also work fine. Usually, a bit of carefully placed acid-free tissue paper can protect hats stored together in a box, and protect the hat from a non-acid-free box over time. You can cradle delicate features such as feather plumes with tissue “nests.” If you have just a few hats or want to show off a few, and they are sufficiently sturdy, by all means do place them on shelves or wig stands. Just keep them out of direct light and give them a dusting from time to time. For dusting and cleaning hats, two interesting tools to have on hand are canned air and a soft paintbrush. You can also work with a hair dryer on its cool setting and any soft-bristled brush. A steamer can help make a warped brim pliable enough to reshape, straighten a crumpled veil, and fluff up a flattened flower. Veils can be particularly delicate and vulnerable, and I store veiled hats with their veils gently tucked inside, tissue separating the netting from the hat if there are any rough spots. Many a very respectable vintage bag has been ruined by being stacked in a pile, with the surface and structure creased, dented or even broken down. The best way to store bags is sitting upright on a shelf, and if the structure needs to be bolstered, you can stuff your bag with a clean old cotton t-shirt, a chunk of unbleached cotton, or a wad of crumpled acid-free tissue paper. Bags are notorious for the odors they transport through the decades, from cigarette smoke to perfume. For the newcomer to vintage, I absolutely recommend choosing a bag with no odors. Stuffing the bag with tissue which is periodically replaced can help remove mild odors. I have used dryer sheets in bags with stronger odors, but of course, one ends up with the dryer sheet's perfume-y odor that will linger. 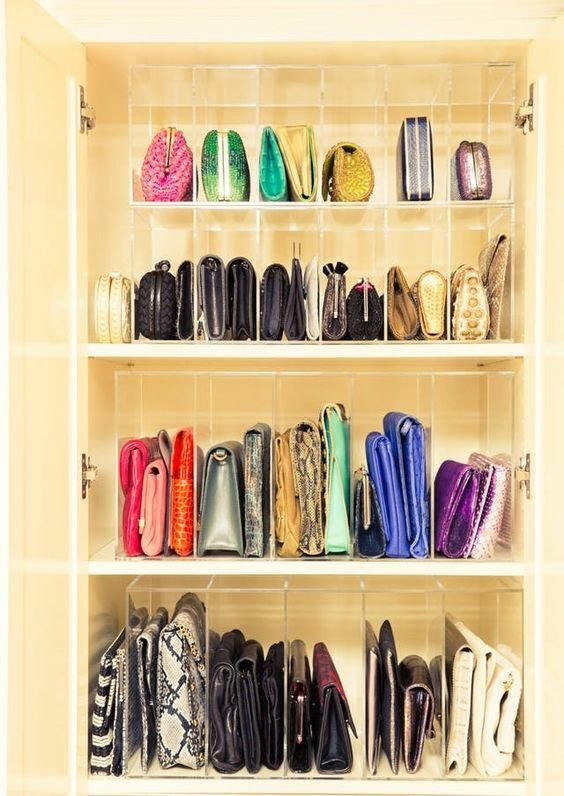 For short-term storage (about 18 months), a shoe rack or placement on a shelf is just fine, but for longer storage it's best to box them and use acid-free tissue to stuff the shoes to support their shape. Take care not to overstuff or you can stretch the shoes. Wrap the shoes individually in more tissue or plain cotton and set them in a box. 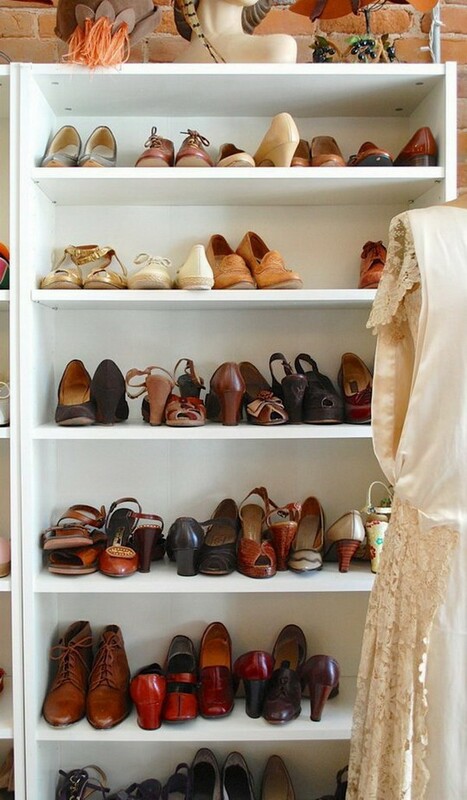 Moisture can promote mildew, so use a breathable cardboard box, preferably acid-free for your most cherished shoes. You can find acid-free photo boxes in just the right size for a pair of shoes. Leather can and should be cleaned and conditioned. I like Cadillac Leather Lotion, which helps to preserve leather, reptile skins, and also imitation leather surfaces. You can use it on your shoes, bags, and even jackets. There are many other products that work similarly, such as saddle soap. Suede can be brushed with a suede brush or rough towel. Suede is not as sturdy as smooth leather, and it will easily absorb dirt, moisture, and oils. If you have a small, dry stain to remove from suede, you can start by softly scrubbing it with a cloth or art gum eraser. Be gentle and don't dig a hole in the suede's nap, but do loosen the stain, and raise the nap that might have gotten stuck down with the stain. You can use a vacuum to help clean out your bags and shoes, and to remove some of the dust from the exterior of any sturdy fabric bags and shoes without beading or other potentially loose embellishments. For those, you can use a screen over the head of your vacuum wand, or use a soft brush to loosen and sweep away dirt. Patent leather (real or faux) can be cared for with some common household products. You can wash off the surface with a damp cloth. A glass cleaner can be used to remove dirt and improve the shine. Use a soft cloth with petroleum jelly or mineral oil to rub out scuffs and then use your cloth to polish the remainder of the shoe or purse. Use a clean cloth to buff to a shine. If you have a stubborn scuff or fogging, first try rubbing it with isopropyl alcohol on a cotton swab. If that doesn't do the trick, using a low percentage acetone (the kind used for fingernail polish remover) with a cotton swab may work. Follow up with mineral oil or petroleum jelly to restore the gloss. With the acetone you'll removing some of the protective lacquer, so use it with caution. If your shoe's insoles have lifted around the edges, I would recommend using a shoe glue such as Shoe Goo or Barge Cement. A paintbrush can help apply the glue. If the insole seems to be coming loose, you might want to carefully lift it off and reglue it entirely. Just like finding a good dry cleaner and seamstress, it is a very good idea to find a good shoe repair shop, one that respects vintage workmanship. Collecting scarves can be addictive, and if you have considerably more than can be reasonably stacked in a drawer, consider a hanging set of loops. You can use any kind of plastic ring so long as they don’t have any rough spots. The added advantage of this hanging method is being able to see them all better. You can almost always hand wash a scarf, even one made of silk, using cool to tepid water and very mild soap or baby shampoo. You may see some dye bleed, but just don't leave the scarf to soak long (or wash more than one at a time) and you will be fine. If you have stains to remove, you can try using the mild soap on the spot as a pre-treatment, first checking on a tiny bit of an edge of the scarf to make sure the color doesn't fade noticeably with the full-strength soap. Don't wring or twist, but roll the washed and rinsed scarf in a clean towel before laying it flat to dry. You can then iron it using a press cloth and a low heat setting just as it reaches a nearly dry stage. Avoid ironing on a rolled (hand-sewn) hem. 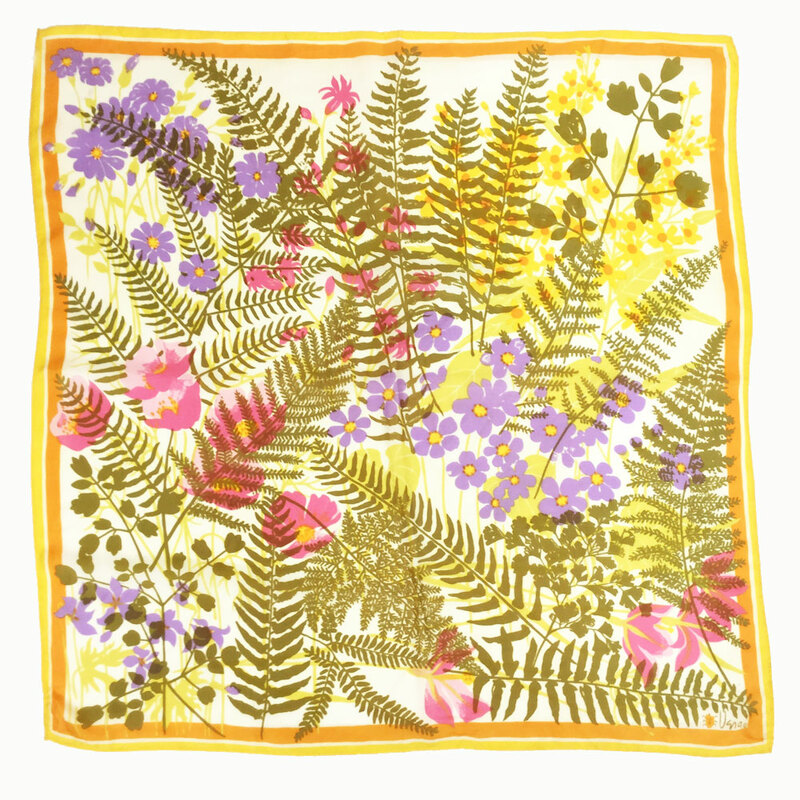 If a silk scarf has lost its gloss, you can sometimes bring some of that back by rinsing it in a solution of white vinegar and water (1/4 cup per gallon). In our mother's and grandmother's days, gloves were often stored in pretty, decorative long boxes. I have so many gloves that I keep them in boxes by color, with one small drawer devoted to long white gloves, and one to short white gloves. The vintage way of washing your gloves is to leave them on and make like you are washing your hands, using a gentle soap and lukewarm water. You can use a soft brush for spots. Invert the gloves and repeat the hand washing, then rinse them thoroughly. Allow the gloves to dry away from heat. Keep the colorful gloves away from their white and cream mates to avoid dye bleed. If you have unlined leather gloves that are clearly stamped "washable" inside, you should be able to wash them by hand successfully using the same technique, but with a couple of additional steps. Roll your washed gloves in a towel from the fingertips to the cuffs, allowing water to drain out the cuffs. When the gloves are nearly dry, put them on, allowing them to shape again to your hands. If you have let them get all the way dry, moistening your hands before pulling them on will help to get the shape back. If the gloves are not clearly marked washable, they haven't been tanned to allow washing and would need to be dry cleaned. Dry cleaning washable leather gloves negates the option of washing them. Any dry cleaned or non-washable leather gloves will shrink badly if washed. After all, you want them to fit like a glove—not smaller!